Terhi joined CRESS in September 2007 as a research fellow working on the EU FP6 funded research project NEMO concentrating on the structures and dynamics of politically induced research networks. In March 2009 Terhi joined another EU-funded research project Qlectives, which focuses on self-organising socially intelligent information systems. 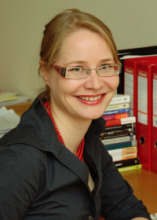 She also works on the research project “Autonomy and governance in European Universities – an international comparison”, funded by the European University Association. Terhi's research interests include structural collaboration and networks in higher education and research, internationalisation of higher education, globalisation, knowledge society, institutions, discourse and governmentality.